2019 RQ PROGRAM - Introducing 4 Fugitives. Each year the RQ wines are released to great anticipation and excitement. Many of the best go on to win awards in wine making competitions. Our loyal customers remember their favorites and request we bring them back again to restock their cellars. Restricted Quantities 2019 program brings you four of our finest award-winning wines, released exclusively in The 4 Fugitives Collection: Chilean Cabernet/Merlot/Syrah, Australian Chardonnay/Semillon, Italian Nebbiolo, and Spanish Monastrell. Journey to the world renowned wine regions of Chile, Australia, Italy and Spain. Discover their intriguing depth and character. NOT FAMILIAR WITH THE RQ PROGRAM? Each year RJS Craft Winemaking offers home winemakers an exclusive selection of outstanding wine kits, developed to feature the best results from grape harvests around the world. 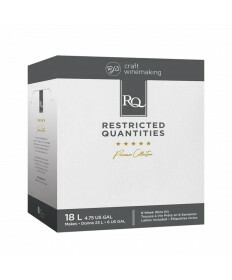 Because these kits are special and unique, each "RQ" kit comes with its own artfully designed labels and bottle dressings. Due to the nature of these kits, they are only available in 'Restricted Quantities', and must be pre-ordered before they're available to ship or pick-up.